Last March we interviewed Zarah Löf-Öhlin, who won the BSDB poster prize at the joint meeting of the British Societies for Cell Biology and Developmental Biology. Zarah’s prize was to travel to Seattle to attend the 73rd Society for Developmental Biology meeting. 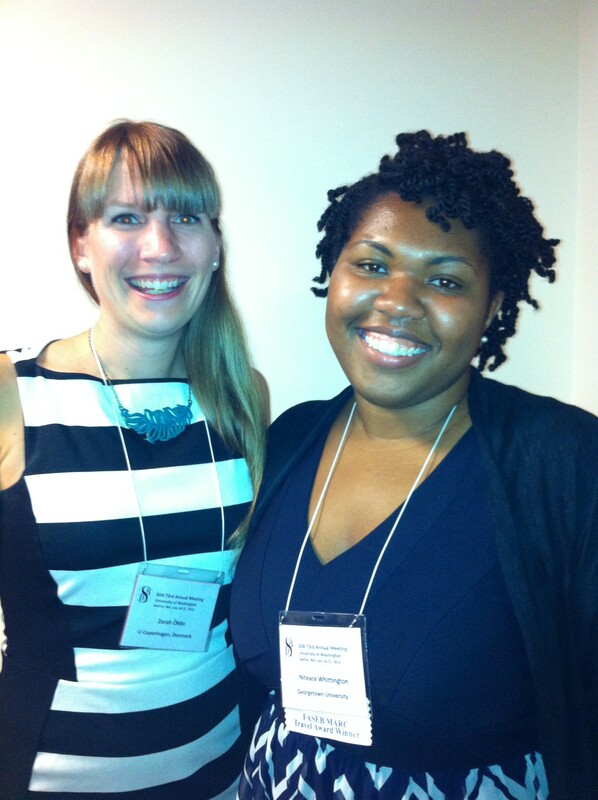 Continuing the interview chain, Zarah interviewed Niteace Whittington, who won the SDB poster prize there. As a prize, Niteace will be attending the BSDB Spring meeting next April, in Warwick, UK. ZLÖ: Congratulations on your achievement. You must be really proud of yourself! NW: Thank you, I am! ZLÖ: How do you feel? NW: I am very surprised, happy and excited. I have never won anything this big before, so it is a really big deal for me. ZLÖ: Is this the first prize that you have ever won at a poster competition? NW: I won a prize during my undergraduate studies for a poster competition, but that was a long time ago. Last year I won a prize for presenting at a regional SDB meeting, but this is the biggest prize I have ever received. NW: Yes, I was awarded the FASEB MARC travel award. I have actually been awarded this travel prize every year since 2010 to attend SDB meetings. It is a travel award aimed at under-represented minorities in the sciences. ZLÖ: In which lab do you work and what does your lab work on? NW: I work with Elena Silva at Georgetown University, in the department of Biology. We are a developmental biology lab, and we study the development of the nervous system. We are particularly interested in identifying the gene regulatory network that regulates neurogenesis, i.e. the progression from a neural stem cell to becoming a neuron. My work tries to understand the function of Sox21, a transcription factor. We want to understand what role it plays in the process of neurogenesis. ZLÖ: And you presented this work here? NW: That is what I presented in my poster. It is my graduate thesis work, so the majority of my life as a graduate student was spent on that poster! ZLÖ: Do you have a lot of time left on your PhD? NW: I have actually defended my thesis in April. I have just finished my PhD. ZLÖ: What are you future plans? NW: I am looking for a postdoc position. I have been talking to a few people here and sending emails. I am really interested in expanding my research and learning new techniques. ZLÖ: Then it is great that you get to go to England. Is it an option for you to move to Europe? NW: We will see after I have visited! ZLÖ: Have you been there before? NW: I have never been to Europe before. It will be very exciting! ZLÖ: Thank you and good luck with everything!